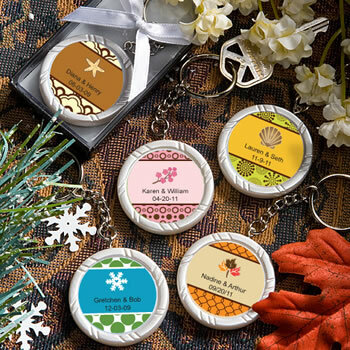 There's no end to the creative possibilities when you express yourself with these Personalized Expressions Collection key ring favors Give a one of a kind favor to your one of a kind crowd with these Personalized Expressions Collection key chains from Fashioncraft. Whatever the occasion - a wedding, Sweet Sixteen, shower, anniversary or any other special event - these favors make it all your own! Each measures 5" x 1.5"" and has a silver metal chain and ring attached to a round white poly resin charm with a grooved pattern rim and an inset center fit for easy application of the personalized peel and stick label of your choice. From assorted color combinations, to seasonal and themed designs, to your own title, you design the eye catching label that suits your style! Each comes packaged in a clear topped box with a black base and silver insert, finished with an attached white satin bow. Does not come with key. Please allow 3-4 days for production.